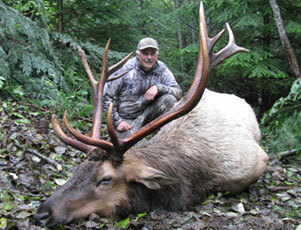 Trophy elk hunting on Vancouver Island! The majestic Roosevelt elk is indigenous to Vancouver Island and is the purest strain of Roosevelt elk left in North America. 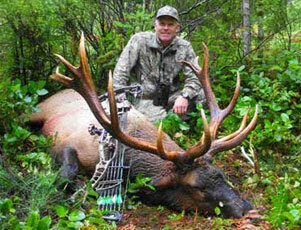 The largest of the elk species, a mature bull can weigh in access of 1000 pounds. With an antler configuration much like that of a European stag, the unique crown points and tremendous mass make this one of the most sought after big game species in the world. Our elk hunting area has produced the #2 Roosevelt elk for Safari Club International as well as the # 2 and # 3 record book bulls for Boone & Crockett. We have maintained a 95% success rate on Bulls that qualify for Boone & Crockett for all of our clients since 1995. Our fall elk hunts for the rifle season begin October 10th of each year and our archery bow hunting season begins on September 10th of each year. Elk hunting openings are very limited and strictly regulated by the Fish and Wildlife Department so we recommend that you plan your hunt well in advance. 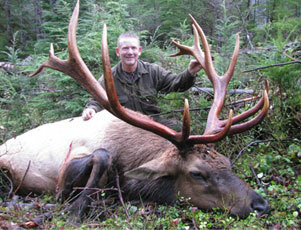 Both the rifle and archery elk hunts run for 10 days. Access to the back country is done in 4x4 vehicles with lots of time spent glassing from strategic vantage points. Once a trophy bull is located a plan to get within shooting range is made. The final stalk is done on foot taking into account the terrain and wind direction. The physical effort required for the final stalk will vary depending upon the terrain. We can plan your hunt with your physical condition in mind. This Roosevelt Elk hunting trip originates from our new Lodge located in the Salmon River Valley in Sayward, British Columbia on Vancouver Island, BC, Canada. It includes wholesome breakfasts served each morning with a hearty lunch and assorted beverages taken into the field. Upon your return each evening delicious home cooked meals await you.